it's nice to start the week after having enjoyed a weekend full of sunshine. monday morning doesn't seem so bad all of a sudden. it's even nicer to say goodbye to winter coats and boots and hang them in the back of the closet. this weekend i said hello to light jackets, oxford shoes and short sleeved shirts. for me one of the most enjoyable activities during the weekend is taking my time getting dressed. it's a nice change from all the running around i do in the morning talking to myself and complaining i have nothing to wear while starring at a closet so full it sometimes seems to burst. this saturday i decided to go retro and my starting point was the polka dot skirt. the shirt also had a retro vibe so it was a perfect choice. there's something about this collar that i love so much, not to mention the cute little buttons dressed in fabric. i was really glad to wear again my olive oxfords i got last year at h&m. i remember they were quite hard to break into. my feet hurt for days on end the first time i wore them, but this time they fit like a glove. 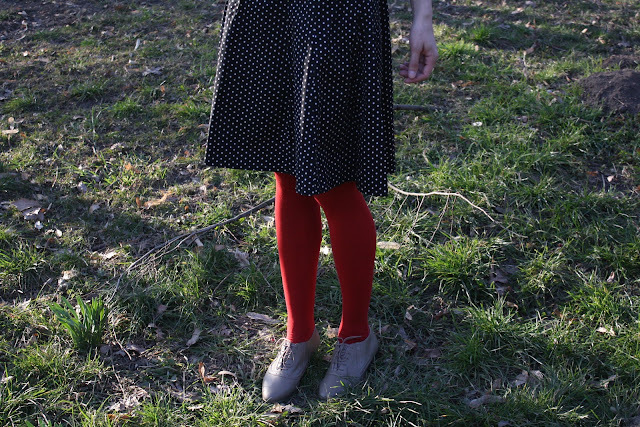 i chose a jacket to match my shoes and couldn't resist adding a bright pop of color with my red tights. and this was my relaxed retro look for the weekend. *gasp* i love your hair!!! great new style. I really like the shape of your bangs. Imi place si tinuta ta. imi plac ciorapii rosii cred ca o sa incerc si eu o data.